An immediate bestseller in France, Making Love is an original and daring retelling of a classic theme: the end of an affair. As much an exploration of setting and place as it is of the affair that comes apart in them, Making Love follows a couple’s final days together in Japan. 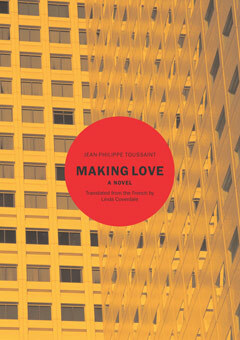 Toussaint writes with an economy and restraint that evoke the distinct imagery of film while allowing a startling proximity to the feelings of his characters. The result is vertiginous, standing traditional images on their head and transposing the conflict and confusion of lost intimacy onto the labyrinthine ultramodernism of Tokyo and Kyoto. Brilliantly written and strikingly original, this is a stunning work of new fiction from one of Europe’s most promising authors. Jean-Philippe Toussaint was born in 1957 in Brussels. He is the author of many novels, including Monsieur and The Bathroom.